The Comox Valley Kickers remains one of the oldest rugby clubs in British Columbia. John Baird, representing the Comox Valley Kickers, attended the inaugural meeting of the British Columbia Rugby Union when it formed in New Westminster on 4th October 1889.The Comox Valley Kickers likely began in early 1889 made up primarily of British miners working in the nearby Cumberland coal mines. Coalminers in Nanaimo, sixty miles down the coast, created the Nanaimo Rovers club — which became the Hornets Rugby Football Club, in 1888 — and on March 29, 1889 it received, and accepted, a challenge from the Comox Valley Kickers to play a game. The Nanaimo Free Press reported that: “The match between the Nanaimo Rovers and a team from Comox was played in Nanaimo on Wednesday afternoon in the presence of 300 or 400 people… The Nanaimo Rovers appeared in a new tunic, the idea of their captain, which is a great improvement.” The new attire must have helped the Nanaimo team as it ran out winners by three goals and a try to nil. On October 4, 1889 members of the Vancouver, New Westminster, Victoria, Nanaimo and Comox clubs attended a meeting in the offices of W.J. Walker and Co. in New Westminster. With John Baird representing Comox, the assembled delegates voted to form the British Columbia Rugby Union. It is not known how long rugby continued to be played in the Comox Valley after this initial burst of enthusiasm, but after lying dormant for a few decades the Comox Argus reported that on October 30, 1922 the Cumberland Rugby Football Club held its first practice on the Wye Ground, “… kindly lent to them by the Canadian Collieries. A large crowd of spectators were present and Rugby is being taken very enthusiastically.” With that rugby enthusiasts in Courtenay called a meeting to see if enough interested young men could be found in Courtenay to form a rival team there. There weren’t, so those in the Valley who wanted to play, traveled up to Cumberland to participate. As became the norm when British warships came into Comox Bay, the local ruggers would challenge the crew to a game. In November 23, 1922 the Valley boys took on H.M.S. Capetown resulting in a 3-3 draw. The local team consisted of: Backs: Hatch, Bannerman, Nunns, Mortimer, Jones, Jackson (Capt.) Wallace. Forwards: Prior, Gough, Finch, Quinn, Tremblett, Rose, Dalby, and Grant. At that time the Cumberland Tigers didn’t play in a formal league and played only “friendly” fixtures, when these could be arranged. Nevertheless, when the Tigers did undertake an away fixture in March 1923, they received lots of local support. “The Cumberland Tigers Rugby Club have been successful in arranging a game with the Vancouver Native Sons, the net proceeds of which will be donated to the Mine Disaster Fund. Arrangements have been made to play at Brockton Oval, Saturday March 17. The “Charmer” is being held over on Friday March 16 till 5 p.m., which will permit the team to get their day’s work in before leaving. This arrangement will make an excellent chance for an excursion. The “Charmer” will leave Union Bay at 5 p.m. Friday, returning leaving Vancouver at midnight of Saturday. Word has just been received from the C.P.R. officials that the team and any party officials from here will get the special reduced fare of $5.45, Vancouver and return. Several of the Native Sons of Canada, which is a lively organization at Courtenay, have stated that they are very anxious to make the trip since it is the Native Sons team of Vancouver, the Tigers are playing.” (The Cumberland Islander, March 10, 1923) Despite their supporters the Tigers fell 19-0 to the more experienced Vancouver team. The club went into hibernation during the mid-20s only to resurrect in 1929 when a team of “All Crocks” played a match, refereed by local realtor Leo Anderton, against the Courtenay High School side defeating them 33-3. The “All Crocks” consisted of: Harvey, Osler, Saunders, Stephens, Moody, Hall, Paul, Hopkins, Bourdillon, Capes, Sid Williams, Reg Laver, McMonnies and W. Williams. The Courtenay H.S. Team: Norman Tribe, John Tribe, Prain, McKee, Laver, Greir, Ball, Searle, McCartney, Jones, Beavan, J. Stephens, W. Scott, Bryant and McMonnies. In June 1930, the local team took on the H.M.S. Dauntless but lost 6-0 and a re-match a week later resulted in the same result. A year later when the H.M.S. Dragon visited Comox Bay the local a team made up of “C” Company, 2nd Battalion Canadian Scottish took on the sailors winning the game 8-0. Four years later, in 1934, a Valley team consisting of: Hall, Tribe, Hewlett, Fairbairn, Sheasgreen, Nichol, McMonies, Morris, Baker, Ellis, Adshead, Scott, Tudway and Harding took on the H.M.S. Danae with the Navy eliciting a full measure of revenge for the loss in 1930, winning 26-0. That same summer a team from H.M.S. Norfolk defeated the locals 26-3 with Walter Inglis kicking the locals’ only points. After a decade of play, however, the Kickers folded for three years only to re-establish again in 1993. It struggled for a number of seasons, despite having retired Canadian 1987 World Cup Captain Hans De Goode playing and leading the team, but by 2005, under coach Bruce Dyke, the Kickers won its first Vancouver Island Third Division Championship in twenty-five years. In 2008 the Kickers engaged a club coach, Blake Sporne a former British Royal Marine, and landed a club sponsor in Le Fevre and Company. In 2009 fortune smiled on the club when former England Trialist Colin Chappell, who had played for the Bath and Western Super-Mare teams in Britain, arrived in the valley. A consummate rugby club-man Colin immediately began organizing a very successful U-16 Junior program, that reached the Island Championship, and later that year began coaching the club’s Women’s team. At the time the club used a disused restaurant space in the Avalanche Hotel as its clubhouse but when approached by the Fallen Alders Community Hall on Cumberland/Royston Road about renting space in the basement of that building, the club began building a clubhouse there and started using the adjacent field on which to hold its training sessions. Soon new poles and floodlights allowed for better vision at Thursday night training sessions and the clubhouse held its first successful functions, a SuperBowl Party and a Tapas Get-Together. The next year, 2010, with the Junior Program in full stride and with new members arriving at the club, the Kickers arranged with the town of Cumberland to use Village Park as its home ground and erected a fine new set of goalposts on the ground. A hugely successful Halloween Party and Awards Dinner rounded out the year in the club’s new facilities. In 2011 the clubhouse flooded when the drains couldn’t handle a week’s worth of heavy rain, but little damage resulted. The club held a Planning Session at the Forbidden Plateau Lodge to establish future goals and Kickers U-17 star Connor Willis represented Canada U-17 on its Easter tour to Britain. In 2012, Director of Rugby Colin Chappell inaugurated a Mini Rugby program for boys and girls with Harry Gaines as his assistant. Unfortunately “Mr. Rugby Everything” Colin Chappell left the Valley to pursue employment opportunities back in England but he left the club in good stead with a permanent home; a thriving Junior team sponsored by Investors Group; Women’s program and a flourishing Mini rugby program as the club approaches its 125th Anniversary. With three teams, Mens, Womens and Juniors, as well as a Mini Rugby Program, the Comox Valley Kickers Rugby Club continues to evolve as one of British Columbia’s, and the Comox Valley’s, longest serving sport’s clubs. 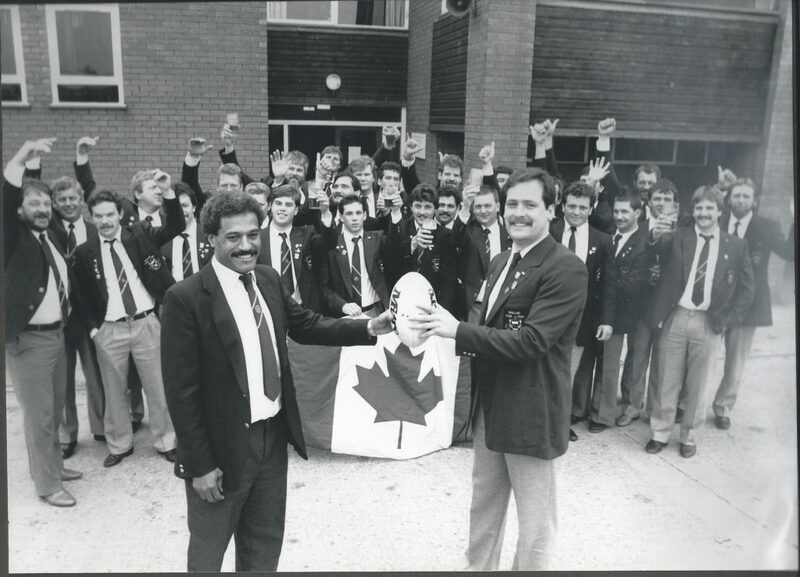 Dear Comox Valley Kickers, I thought you might be interested in this picture from the Comox Valley Kickers England tour in 1988, it was a welcoming gift that was given to all of the touring members by Sutton Coldfield RFC.